Most people don’t love having a boss. Bosses tell you what to do and they berate you when you screw up. According to a 2015 Gallup survey, half of all U.S. workers have at some point in their careers left a job specifically because they didn’t like their bosses. Unless you rise to be the CEO and Chairman or Chairwoman of your company, however, you will always be working for someone. Unless, that is, you are self-employed. Want to become a real estate professional? Learn the ins and outs of home-buying with SmartAsset’s home-buying guide. Of course, becoming self-employed is often easier said than done. Whether you make your money in marketing or manufacturing, chances are the vast majority of work opportunities in your field involve a manager and a W-2 form. For workers who are willing to change directions, however, there are some jobs that require little additional education and in which the majority of workers are self-employed. Real estate. 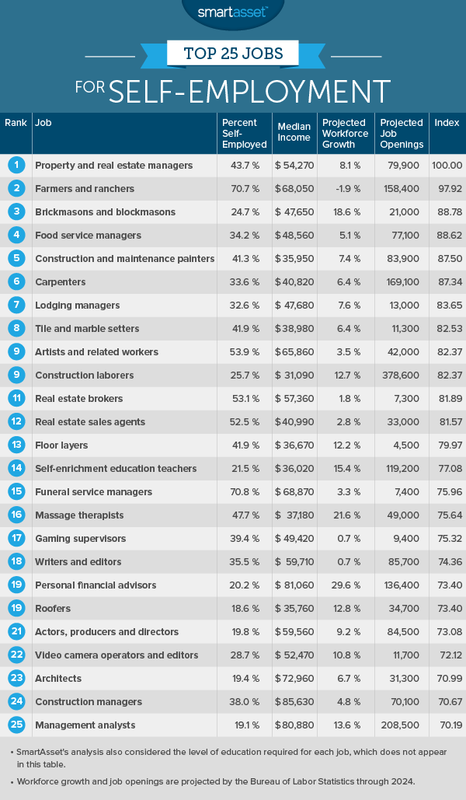 Three of the top 12 self-employed jobs are involved in the real estate industry. Real estate and property managers rank first over all, while real estate brokers and real estate sales agents rank 11th and 12th, respectively. Skilled trades. Construction industry workers, especially tradesmen, are often self-employed. Brickmasons, carpenters and tile setters all rank among the best jobs in SmartAsset’s study. About 43% of property managers are self-employed. Among their responsibilities are grooming the grounds and showing apartments to potential new residents. According to the Bureau of Labor Statistics, the job requires no formal education beyond a high school diploma. Nonetheless, the median income of property managers in the U.S. is $54,270. You might say that being a property manager is… super! Through a combination of modern technology and traditional techniques, farmers today get more out every acre than their predecessors. Higher yields can mean more money. 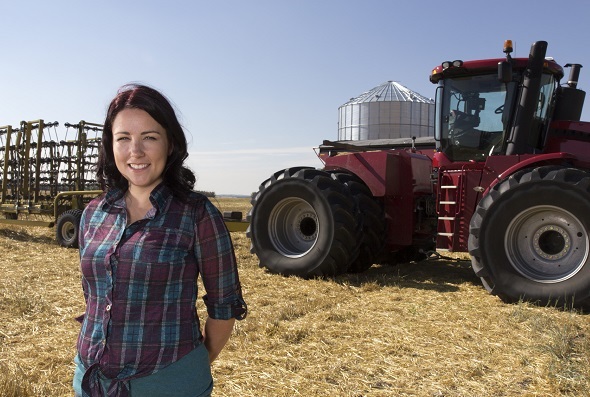 Farmers and ranchers in the U.S. earn a median income of $68,050, according to the Bureau of Labor Statistics. Though formal education beyond high school is not a requirement for farming and ranching, it helps to know the land you’re tending or the livestock you’re raising. Try SmartAsset’s free income tax calculator. As much art as science, masonry requires careful placement of bricks and blocks, bounded together by various types of mortar. About a quarter of masons (not including stonemasons) work for themselves. Job growth for masons is expected to be strong over the next decade, at 18.6%. Self-employed food service managers are those who own and operate their own restaurants or catering companies. It’s hard work, and many such ventures do not succeed, but for those that do the results are rewarding. The median income for food service managers (including those who are not self-employed) is $48,560. It’s worth noting, however, that only about 34% of food-service managers are self-employed, so take these numbers with a grain of salt. There are more than 360,000 construction and maintenance painters in the United States of America. According to the BLS, industrial painters in particular will be in demand over the next decade, with excellent job prospects, particularly in the Gulf Coast states. The median income for these painters is $35,950 and 41.3% of them work for themselves. If you like working with power tools, then this may be the job for you. The Bureau of Labor Statistics projects 169,100 openings for carpenters over the next decade, so there will likely be lots of opportunities in the field. 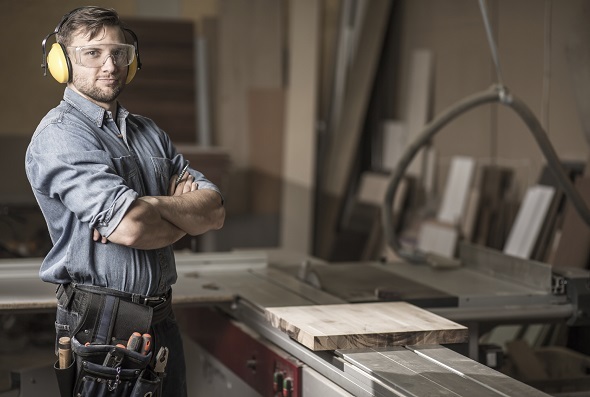 While you don’t need any formal education above a high school education for these positions, many states have licensing requirements for carpenters. It’s a good idea to do some research if you are considering switching or starting a new career. About one-third of America’s 48,400 lodging managers are self-employed. These may be bed-and-breakfast owners, or even people who earn a living managing their own Airbnb. The median income for all lodging managers is $47,680. Keep in mind, however, that if you are self-employed you will need to buy your own insurance. Forget the laminate, these guys lay down the real stuff. There is no formal education requirement in the field of tile and marble setting, though experience or even an apprenticeship is generally necessary for anyone who wants to be self-employed. Overall, the median income in this field is $38,980. This job category includes craft artists, animators, multimedia artists, painters, sculptors, illustrators and art directors. The median income for people employed in those fields is $65,860 and more than half are self-employed. Of course, you can’t drop your day job and become a successful working artist overnight. Art requires practice – and talent. Find out now: Is a 401(k) a good choice when you’re self-employed? Being a construction laborer is not easy, but it requires no formal education and there promises to be lots of opportunity for work over the next decade. In fact, over the next decade, there will be 378,600 job openings due to growth and replacement needs, according to the BLS. That is the fifth-most of any job in SmartAsset’s analysis. Percent of the workforce that is self-employed. Projected workforce growth through 2024. Projected job openings due to growth and replacement needs through 2024. We ranked each job on those five criteria. For the level of education, we considered a lower requirement to be better, as people who are considering a career change may not be able to return to school before entering a new field. Next, we averaged the rankings for each job across the five criteria. We gave double weight to the median income and level of education required for each and full weight to all other metrics. Lastly, we calculated an index score from 0 to 100 based on that average ranking. The city with the best average scored a 100.